Secretary-General Ban Ki-moon today highlighted the importance of continuous collaboration between the United Nations and the Organization of Islamic Cooperation (OIC), stressing that the two bodies have a responsibility to address people’s aspirations in the Arab region, which has recently undergone significant transitions. “I am encouraged that cooperation between our two organizations has significantly increased in the socio-economic and political fields, particularly in the area of conflict prevention and resolution,” Mr. Ban said in a message to the 12th session of the Islamic Summit Conference held in Cairo, Egypt. Mr. Ban said the two organizations should work together to address the humanitarian crises in Syria and Mali, and ensure all parties avoid any further militarization and engage in a political process. Working to advance the Middle East peace process through negotiations should also be a priority, he added. In his message, Mr. Ban thanked OIC members for their contributions to addressing long-standing issues in Afghanistan, where both organizations are working on peace and reconciliation efforts; Sudan and South Sudan, where both governments have taken positive steps to resolve their issues; and Somalia, where the OIC played an integral role in supporting citizens to complete the eight-year transition period. Mr. Ban noted that there is still much to be done to combat terrorism and called for intensified efforts to build States’ institutional capacities to effectively deal with this menace. “I share your concerns with rising intolerance and discrimination such as Islamophobia. Unfortunately, we have witnessed a rapid escalation of incidents, many of a brutal nature, involving people and communities from all religions,” he said, adding that later this month, world leaders will have a chance to address this issue at the Fifth Forum of the UN Alliance of Civilizations in Vienna, aimed at countering hatred and uniting people of different faiths and cultures. Mr. Ban also welcomed the commitment of OIC members to achieve sustainable development and deal with challenges on the social, economic and environmental fronts, and the impacts of climate change. The eight Millennium Development Goals (MDGs) range from halving extreme poverty to halting the spread of HIV/AIDS and providing universal primary education, all by the target date of 2015. 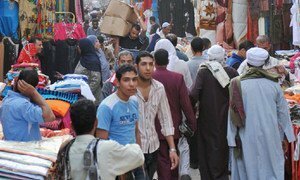 After decades of skewed development policies, social injustice, and poorly managed economic liberalization, Arab countries must rethink their growth strategies, says a United Nations report released today, stressing the need for improved governance to achieve progress.